Setting Up Camp in the Rain, What’s Your Solution? | "What Goes Down, Must Come Up!" Setting Up Camp in the Rain, What’s Your Solution? It’s raining now at my house. So I did what any backpacker does, I started anguishing about setting up my tent in the rain and minimizing my discomfort. My current tent is the REI quarter dome (3lbs 14 oz, without stuff sack). I’ve watched my fellow hikers from Obsessive Compulsive Backpackers set up their hubba hubba’s and brag that if it rains they can just set up their rain flys and crawl in for the night. I took my pole set and snapped them altogether. I then laid out my rain-fly over the poles and connected the primary rib pole, not hard. I then attached the first side pole to the first fly corner and tried to attach the other end to the grommet on the inside just over the first door, very very tight. I then tried to repeat the process with the other pole, it’s pouring rain mind you. The quarter dome’s poles are not 2 poles crossing and going corner to corner, there are 3 poles, a main rib pole, going corner to corner, then 2 slightly smaller poles that go from 1 corner, over the rib and to a grommet over the door on either side, it’s kind of weird but I guess this is a weight saving strategy. As I connected each of the shorter poles to the door grommet, the rain-fly kept flipping in and out under tension, but I managed to finally get it together and stake out the 2 vestibule ends. I then crawled in with the actual tent and laid it out on the grass. The actual tent is all screen over the nylon bottom, with very large screen doors on each side, also a weight saver. I spread out the tent and fasted each corner to the poles. I then sat upright in the tent – out of one of the screen doors and then proceeded to clip the tent to the poles. The clips are on the outside of the screen top, but it turned out to be pretty easy. The hard part was un-clipping the ends of the shorter poles, fastened in the rain-fly grommets over the doors (under tension) and trying to clip then into the grommets on top of each screen door, while sitting inside the tent. I had to really bend down the poles to do this and was pretty worried about snapping a pole. But once it was done, the tent was set up pretty good and still pretty dry for all that thrashing around. My wife came looking for me about that time and calling from the garage back door, heard my voice inside this newly erected tent in the backyard, in the pouring rain, and I could hear her thinking – WTF is this idiot doing now? So, what’s your plan? I’m ready to steal good ideas! 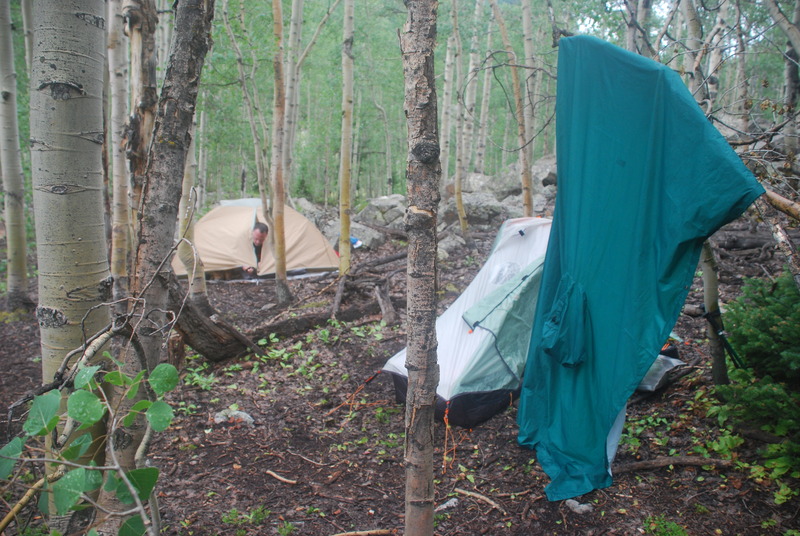 This entry was posted in Equipment, Hikes in Virginia, Really Random stuff, Uncategorized and tagged backpacking, RAIN, RAIN CAMPING, REI QUARTER DOME, SETTING UP TENT IN RAIN, tent on April 22, 2012 by Dragin. It’s a really good idea to practice task such as that, while in those conditions (raining and in the back yard). Better to learn in a controled environment rather than in the back country. I totally agree, train as you’re going to fight. That’s also why I wear for my training walks what I’m going to wear on the trail, that way there are no surprizes!